New continent. New monsters. Great stories. Part of what I liked about the first collection in this series, European Monsters, was that it brought a very clear guideline to how it was going to go about celebrating the monster story. By returning to the place of origin, by giving writers who grew up with stories of these creatures a chance to throw away or complicate the ways in which monsters had been made "mainstream." That guideline remains very much intact for this second collection, African Monsters, which moves across the Mediterranean and into a whole new continent of monster stories. I think in some ways it was a good choice to begin in Europe, mostly because European monsters have been the most portrayed in Western film, television, and novels. The first collection took one step away, shifting the focus to monsters in their natural habitats, but still mostly familiar ones. 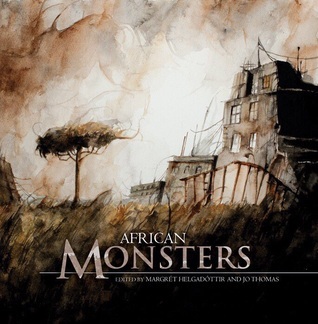 African Monsters takes the next step, with a collection of stories featuring, well, African monsters. Written by African authors. And the result moves from funny to dense to pants-wettingly terrifying to sweet and back again. It's perhaps no surprise, given that these stories are about place, about origins, that many of the themes that echo through the collection are concerning the characters' relationships to their home. Immigration, for example, recurs fairly frequently, and opens the collection in Nnedi Okorafor's "On the Road," which sees Chioma, an American by birth, in Nigeria visiting family. The story examines Chioma's complex relationship with place, with the monsters lurking without and within, with her family and with her own identity. It's a startling story, violent and uncomfortable, but also a great way to kick things off, revealing a monster of faces, mysterious and dangerous. One that doesn't linger in the why, because the why is in some ways unknown and unknowable. But present all the same, and capable of great things. But immigration and place also come to play in stories like "Sacrament of Tears" by Toby Bennett, about a missionary who finds himself a victim because he refuses to see the people he's trying to convert as more than savages. And again in "After the Rain" by Joe Vaz, about being an outsider even in the place you grew up. About moving away and not exactly being able to move back. And of course in "Taraab and Terror in Zanzibar," where two monsters from different places meet, find in each other something kindred and yet very, very different. The story expertly deconstructs the idea that Africa is one country, one culture, breaks apart the way Africa is often portrayed in Western media as needing no other clarification than continent. I just love how varied the stories are in the collection, from suspenseful procedurals like "Chikwambo" by T.L. Huchu, where a cop has the unsavory job of tracking down a mysterious killer, to the rather romantic and longing "Acid Test" by Vianne Venter, which looks at a near-future where the environment has been ravaged to the point where an entire city has been lost thanks to corruption and poor planning. There's the charming-until-it's-heartbreaking "Thandiwe's Tokoloshe," about a child's confrontation with the tragedies and unfairness and random losses of the world. And there's "Bush Baby," 'by Chikodili Emelumadu, a story about family and inheritance and desperation. Each story is both achingly human and touched by the monstrous. And in that the stories challenge what is human and what is monstrous, what is most frightening: the intrusion onto our world of something unseen and hungry, or that such creatures are called, that people seek them out for profit or protection or revenge. I think if I had to pick a slight disappointment it would be in the graphic stories, which seem a bit rushed when experienced next to everything else. The artwork is well done and the storylines are interesting, but there is a sense that they don't quite have the space to stretch out like the fiction does. I still enjoyed them, with "Death of the One" by Su Opperman being a violent and powerful battle with mythic implications and "A Divided Sun" by James Bennett and Dave Johnson looking at the urge to embrace the monstrous in a situation that seems inescapable. With the former, though, I felt a little lost without a bit more context to help me figure out what was happening, and the later was a bit too clean, wrapped things up a bit too quickly and cleanly for my tastes. The artwork throughout the book, though, is incredibly well done (though perhaps I would have liked it if the pictures were held until after the monsters actually appeared in the stories, as there were a few that felt vaguely spoilery to me). But having the pictures gave that added wrinkle to the text, made it pop more with visuals for monsters that (for the most part) I had never seen visually represented. And overall I think the collection just does an amazing job of telling monster stories. "A Whisper in the Reeds" by Nerine Dorman remains one of my favorites in a collection full of stories I liked. A sensual story about loneliness, about being trapped, about not being sure of the future, I loved the way it built the strange encounters between a young man and the monsters of a river. Perhaps also why I enjoyed "One Hundred and Twenty Days of Sunlight" by Tade Thompson, which swirls around similar themes of loneliness and fear and longing. Of wanting to sink, wanting to be buried. Probably my personal tastes showing through, but both stories excelled at showing how, at times, it's the world that makes monsters. Through pain and isolation, through hatred and fear, it's humanity that manufactures its own shadow, its own hunter and destruction. Bonuses: +1 for SO. MANY. MONSTERS!